CAPT. RICH ROBERTS (CAF & US AIRWAYS) Narrates this technical documentary from History, through Pre-Flight, Navigation and Logistical challenges in this behind-the-scenes and very candid view at Airplane & it’s unique crew. Filmed in the skies over the beautiful Inter-Mountain Northwest, an entertaining, captivating and VERY EDUCATIONAL 70 minute presentation. TOO Close For Comfort… TS Season Returns! …As soon as I applied full throttle to the little C150, the winds bee lined from 300 @ 6 (RWY HDG) to 14G22 out of 270, and almost full rudder was needed just to keep us aligned (Hint #3). Rotating into what should have been a 400 FPM climb, it just lumbered along as if to say “You sure you want go there?” (Hint #4). Barely climbing with an increasing groundspeed (Hint #5) the airspeed indicator dancing between ends of the green arc (Hint #6). How many clues does it take? “Down draft! 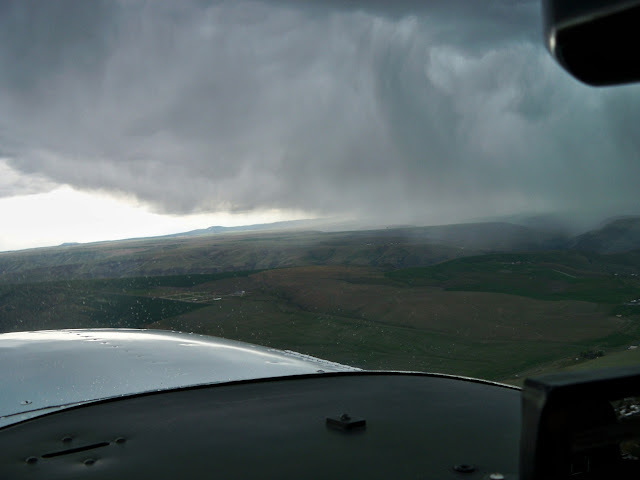 My airplane.” Instructor commanded over intercom as we narrowly cleared what would be the edge of the plateau. Still flying … barely. We were now in that shaft of rain that seemed so far away (Hint #1). Ground-speeding faster still showing 60kts and trying to squeeze every vertical foot out of our violently pitching aircraft, it had gone from “pleasure” to “pressure” flight in 6,000’ horizontally in less than a minute. On the radio three other aircraft squawking their displeasure at this sudden turn of weather, trying to race in below the cascading curtain. One pilot said “It’s like this for 100 miles… this is the alternate”. Tower, dutifully accommodated (while clamoring to amend the METAR) all of us in a controller equivalent of “All aircraft cleared for landing, any runway.” We positioned ourselves for a very short final for RWY30, then RWY26, then, cleared to RWY30 again-much like the winds now 19G32 teetering between 270 & 310 degrees with an occasional 060 just to keep things interesting. Two aircraft in front, one aside, landing like a carefully choreographed routine, one clearing the runway as the other would land adjacent… couldn’t have been scripted any better by trained formation pilots! Then it was our turn as the instructor, keeping power in, jammed the nose down and pointed it at the numbers. “Keep our speed up in that downdraft” she said. We spiraled down to a 45 degree final. Right before the threshold, we cut throttle and began a 5,000’ flare down the 6,000’ surface. Settling as gracefully as if driving over a small log, but alive and on the ground. Hands melded to the shape of yoke, braking together, barely, we made the last taxiway. Tower had already cleared us to the gate back at the ‘first’ flare. Lighting crashed; I later noticed how close the flash really was when I had to reset my blinking dashboard clock. That was close enough into the “mouth of doom” for us that day. Always get the full weather briefing from approved sources EVEN IF “it’s just pattern work” Conditions change very rapidly near severe weather. In our case, the time it took to taxi and perform a run-up. USE YOUR ADM. in a reasonable logical order, beware of “macho”, “complacent”, and “Oh we’ve done this A MILLION TIMES BEFORE” it can kill you… Wondering about limits and extremes is best served over a warm cup of vending machine coffee in the pilots lounge ~ Not while flying them. If you’re ready to depart, and find yourself thinking; “Hmmm, SHOULD we, or SHOULDN’T we?” Chances are pretty good this is probably good time NOT to. the longer it takes to justify (like our departure) the less likely it is we should actually do it! There’s a REASON to avoid severe weather by 20+ miles. Just because you can’t see it, doesn’t mean it’s not there- Inflows, outflows, sudden core shifts and even hail cascading out of sides of clouds …. Again, more fun watching from the ground than from un-expectantly IN IT. LINK: to the VIDEOS PAGE and see some incredible cloud development shots!! !